Forces cause accelerations. Forces do not cause motion. Forces cause changes in motion. This misunderstanding is shared by almost everyone who has ever lived at some point in their lives because of our interactions with the world. However, just because something has a velocity does not mean there is a force. Forces cause accelerations. The vector sum of the forces on one object is equal to the mass of that one object times the acceleration of that one object. Newton's second law only applies to a single object at a time. While easy to say, it takes a long of time to become proficient in using N2 to solve problems. Must practice. Find all forces on that one object. Find vector sum of all the forces (use free-body diagram). Set equal to the mass of that one object times the acceleration of that one object (also a vector). Extract scalar relationships that can connect what you know with what you want to find. Because there isn't really more to Newton's Second Law than saying it. More words are not the answer. The answer is seeing examples done. Make note of how I use the general problem solving strategy with these. Let's look at another example, this time with two objects. You: Um, what? Why is there an entire topic on massless pulleys? Are these really so important in modern science and engineering work? Me: Well, no. However, introductory physics textbooks are full of problems with them, and they assume you've been working with them your entire life. In this section, I'll let you know how to handle these things, and it gives us an excuse to practice more Newton's Second Law problems. 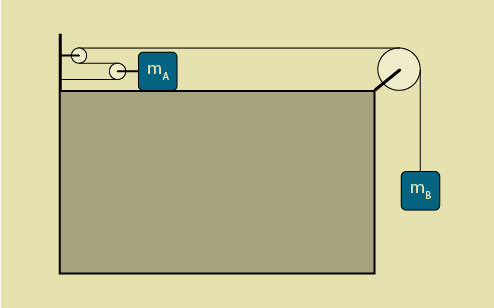 A pulley redirects a tension force. If the pulley is massless, then the tension is the same on either side of the pulley. This is not true if the pulley has mass. This redirection means that our problems will not necessarily be in one dimension, but our application of Newton's Second Law can still be. We will also see more than one object. However, that means you have to apply N2 more than once, since N2 only applies to a single object. Pulleys can be arranged to compound forces. This is why they are actually important in everyday life. They allow you to apply forces greater than you can apply by yourself. We'll see how that works. 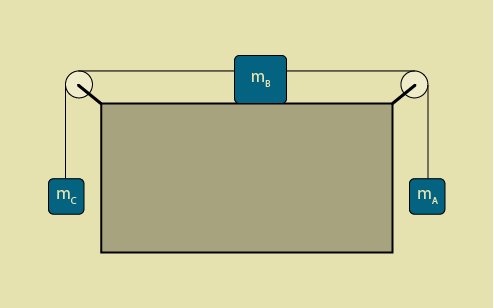 The figure shows three masses, \(m_A = 3\) kg, \(m_B = 2\) kg, and \(m_C = 1\) kg. The surface is frictionless and the pulleys are massless. What is the magnitude of the acceleration of block \(B\)? Alice (60 kg) is climbing a rope that goes over a massless pulley as is attached to a box of mass 100 kg that is 1 m off the ground. What is her acceleration up the rope if the box is hovering motionless? The figure shows two masses, \(m_A = 10\) kg and \(m_B = 2\) kg. The surface is frictionless and the pulleys are massless. What is the magnitude of the acceleration of blocks and the tension in the wire?